It has now been roughly seven years since the devastating housing crisis rocked our great nation. Between 2007 and 2014, foreclosure activity ran well above historical norms after exotic lending and sky-high home prices eventually brought down the entire real estate market. But the foreclosure rate has since fallen to pre-crisis levels as problem loans were dealt with in one way or another. For some, a loan modification has meant a second chance to erase past mistakes. For many others, the outcome wasn’t as positive. Their homes were lost via short sale or foreclosure and they must start anew. Of course, this may have been deliberate in some cases thanks to a phenomenon known as strategic default. Regardless, many of those who lost their homes will now be able to get another crack at homeownership over the next several years. These folks are known as “boomerang buyers,” and are primarily Gen Xers or Baby Boomers. Well, foreclosure waiting periods enforced by Fannie Mae, Freddie Mac, the FHA, and so on generally bar previously foreclosed homeowners from obtaining mortgages for seven years. For short sales, the wait is only four years in many cases. Yes, there are exceptions to the rule that shorten these windows, and even programs that allow for mortgages just one year after such a negative event (or even one day!). 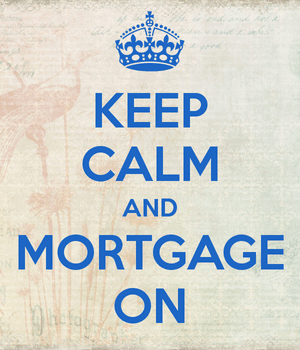 There are also those who can buy a home with cash. But generally it takes a considerable amount of time to bounce back and improve your credit history, regardless of the rules that are in place. Seeing that it’s now 2015, the potential pool of boomerang buyers is growing in numbers. A new analysis from RealtyTrac reveals that some 551,000 individuals will be able to buy a property again this year, assuming they still favor homeownership. The number of boomerang buyers is expected to rise year after year until 2018 when the number peaks at over 1.3 million, then slowly decline through 2022, just as foreclosure rates have done. This means the housing market might get an unexpected boost in demand at a time when supply is still low. Hello higher home prices? Where Are All These Boomerang Buyers? As you might expect, the areas hit hardest by the crisis should have the largest number of potential boomerang buyers. That explains why Phoenix, Arizona leads the nation with nearly 350,000, followed by Miami with 322,000 and Detroit and Chicago each with over 300,000. 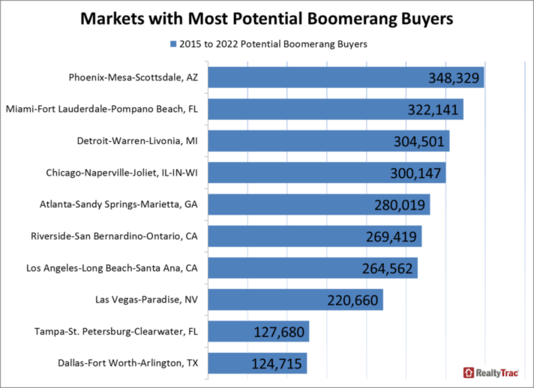 The largest share of potential boomerang buyers (as a percentage of total housing units) can be found in former foreclosure hotbeds such as Las Vegas, Merced, Stockton, Cape Coral-Fort Meyers, and Modesto. Of course, in order for a potential boomerang buyer to become an actual homeowner the conditions need to be just right, kind of like conditions here on Earth. RealtyTrac notes that the “trifecta of market conditions” includes an area where a high percentage of homes were lost to foreclosure, where home prices are still within reach to median income earners, and where the population of Gen Xers and Baby Boomers has held steady or increased. The company found 22 metros (with a population of at least 250,000) meeting these criteria. The top five are Las Vegas, Tampa, Orlando, Cape Coral-Fort Myers, and Charlotte. Phoenix wasn’t on the list because it’s Gen X/Baby Boomer population fell by 2.64% from 2007 to 2013. Miami isn’t ideal either because its housing payment to income ratio is over 28%. In any case, the toughest part will be convincing these individuals to buy again seeing that home prices are already back near peak levels.